The holidays are coming soon, so we thought we'd share two HealthKit features that will help you keep on top of any upcoming personal appointments, and also have a full overview of your practice's calendar - so you can enjoy the festive season whilst your practice is running smoothly. You can add a personal appointment to your calendar at any time of the day or night, on any day of the week. By adding your personal appointments, from gym classes to Christmas functions or lunch meetings, you can ensure personal and patient commitments do not clash. 4. Fill in the details of the appointment and save. The personal appointment has now been successfully added to your calendar. You can set recurring and repeating personal appointments which function in the same way as recurring and repeating appointments for patient appointments. 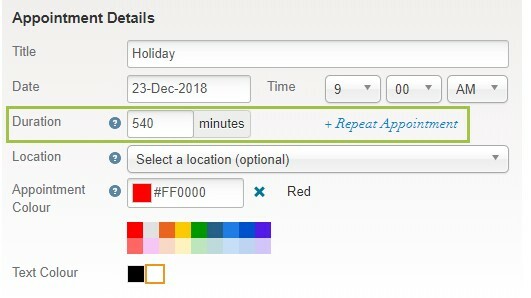 To block out holidays or leave in your calendar, you need to make a personal appointment for the time period you will be away. 2. In Duration, add what would be a full day's work in minutes (e.g. 540 minutes is the number of minutes you'd block if you work from 9 am to 6 pm). 4. Repeat appointment (for the number of days you need) or enter the end date of your holiday and save. You can also select a colour for the appointment, and for the text on the appointment - so when you make another personal appointment with the same title, HealthKit automatically prepopulates the appointment colour and duration for you. Keep track of your practice's day to day activities during the busiest time of the year with an overview of the schedule of all practitioners working at your practice. If you are in a group practice and have an access level that allows you to view others' diaries, you can view multiple practitioners' calendars all together in the Day view of your calendar - which makes appointment and practice scheduling easier and simpler. 3. Click on the login toggle at the top right of your screen (where your name is shown) and then select which practitioners' diaries you want to view at the same time. The selected practitioners' diaries are then shown in the calendar. You can also watch this video to see how to do this. SMS and email reminders automatically notify your patients of appointment times and changes - saving you time and reducing your no-shows. HealthKit integrates the clinical tools and templates you need in a complete clinical management system that you can access for free, anytime anywhere.